DATE OF PUBLICATION OF THE OFFICIAL VALID STANDARD : 27. 11. 1989. FCI-CLASSIFICATION : Group 7 Pointing Dogs. Section 1.1 Continental Pointing Dogs, type « Braque ». With working trial. CRANIAL REGION : Skull : Seen in profile, the skull is in the shape of a very open arch. Seen from the top, it forms lengthwise an elongated ellipse. The width of the skull, measured at the level of the zygomatic arches, should not exceed half of the length of the head. The bulge of the forehead and the supraorbital ridges are perceptible. The frontal groove is visible and ends at mid-length of the skull. The interparietal crest is short and not very prominent. The occipital protuberance is pronounced. Stop : Not pronounced. FACIAL REGION : Nose : Voluminous, with large well opened nostrils, protrudes slightly over the lips with which it forms an angle. Colour : More or less pink to flesh-colour or brown, depending on the colour of the coat. Eyes : Semi-lateral position with a soft and submissive expression, neither deep set nor prominent. Eyes fairly large, eyelids ovalshaped and close fitting (no entropion or ectropion). The iris is of a more or less dark ochre or brown colour depending on the coat colour. BODY : Topline : The upper profile of the back is made up of two lines : one, almost straight, slopes from the withers to the 11th dorsal vertebra; the other is slightly arched, joining with the line of the rump. Withers : Well defined, with the points of the shoulder-blades well separated. Croup : Long (about 1/3 of the height at the withers), broad and well muscled; the ideal pelvic angulation (angle formed by the pelvic girdle with a horizontal line) is 30°. Chest : Broad, deep and well let down to level of elbows, without forming a keel, with well sprung ribs, particularly in their lower part, and sloping. Underline : Lower profile almost horizontal in its ribcage part, rising slightly in its abdominal part. FCI-St. N° 202 / 07.08.1998 5 TAIL : Thick at the base, straight, with a slight tendency to taper; hair short. When the dog is in action and especially when questing, is carried horizontally or nearly like that. Should be docked at 15-25 cm from the root. Front feet : Strong, slightly oval shaped; well arched and tight toes, with strong nails well curved towards the ground. Colour of nails is white, yellow or brown, of a more or less dark shade depending on the colour of the coat; pads elastic and lean. HINDQUARTERS : Upper thigh : Long, parallel, muscular, with a rear edge almost straight. Hocks : Wide. Metatarsus : Relatively short and lean. SKIN : Tough but elastic; finer on the head, the throat, the armpits and on the lower parts of the body. FCI-St. N° 202 / 07.08.1998 6 The visible mucous membranes must be of a corresponding colour with the coat, but never show black spots. The mucous membranes of the mouth are pink; in the roans or white and chestnut coloured dogs they sometimes show brown or pale chestnut spotting. IZE AND WEIGHT : Height at the withers : Between 55 and 67 cm. Preferred size for males : 58 - 67 cm. Preferred size for females : 55 - 62 cm. Weight : Between 25 and 40 kg depending on size. • Accentuated undershot mouth, overshot mouth. • Coat black, white and black, tricolour, fawn, hazel, unicolor, with tan markings. • Absence of pigmentation (Albinism). • Mucous membranes, skin and annexes with traces of black. • Size of 2 cm above or below the limits indicated in the standard. •Only functionally and clinically healthy dogs, with breed typical conformation should be used for breeding. Click Here to Learn about breeder background checks on Bracco Italiano breeders if you are looking for Bracco Italiano puppies for sale. Click Here to learn how ResearchBreeder.com can help you find healthy Bracco Italiano puppies for sale. Click Here to order a Breeder or Kennel Background Check on Bracco Italiano Breeders that may have Bracco Italiano puppies for sale. Click here to find the national breed club for Bracco Italiano puppies for sale. 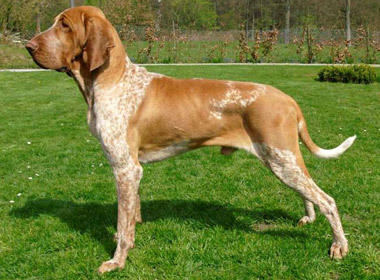 Click Here to purchase a list of approved ResearchBreeder.com Bracco Italiano Breeders who have Bracco Italiano puppies for sale.